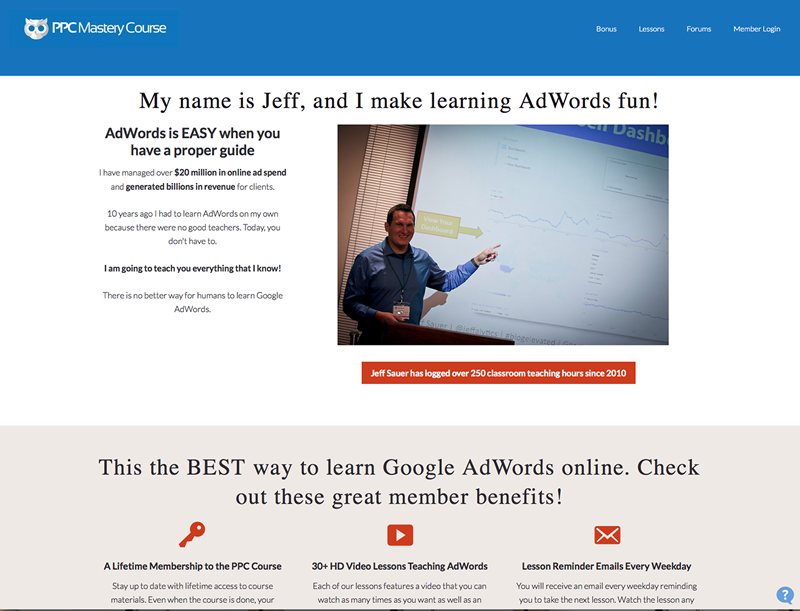 AdWords Training: Why learn AdWords? Google AdWords is a pay-per-click advertising service which allows you to advertise in Google’s search results. It has the huge benefit of allowing you to reach people at the exact moment they are searching for something. Organic traffic and SEO (Search Optimisation) can sometimes put you in front of the right people at the right time, but it’s a bit hit and miss. You might be on the first page one day, and then lost in obscurity the next. More likely, you never get on the first page at all. Advertising with AdWords will put you on the first page instantly. It’s a unique way to reach your customers and generate sales, but it’s quite complex and you need to learn how to use AdWords properly to get the best out it. So what is the best way to learn Google AdWords? Which are the best AdWords courses and tutorials that will help you learn AdWords as quickly and painlessly as possible? 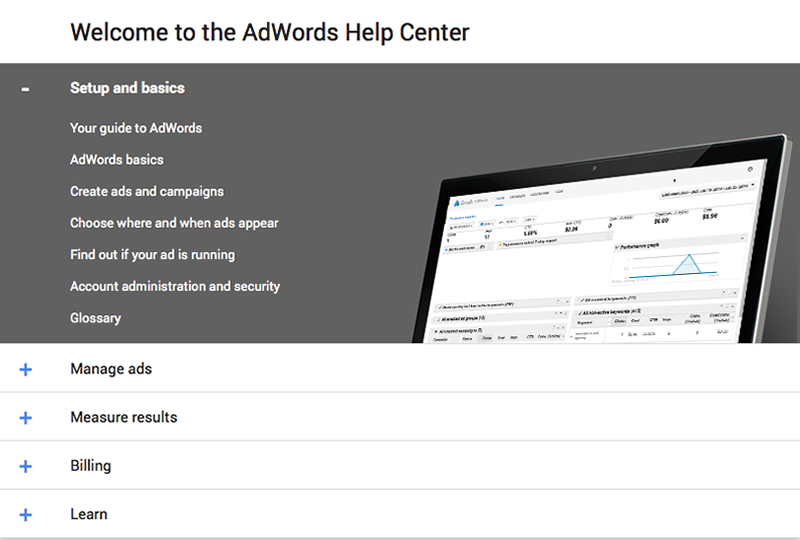 Google’s own learning resources for AdWords are a very good (and free) starting point. The training is broken down into sections and you can dip in and out as necessary. There are also some very good videos if you prefer not to wade through screenfuls of text. 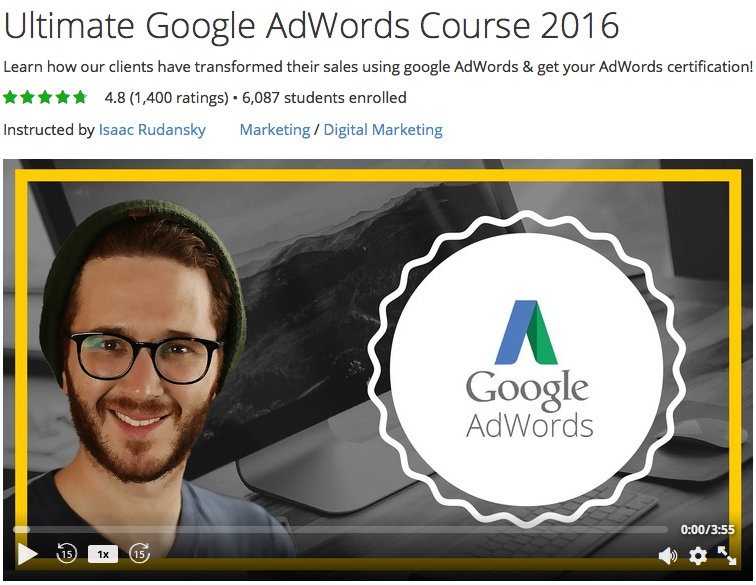 This AdWords course has the highest student satisfaction rating of any course in Udemy’s marketing and advertising section. And I can see why. 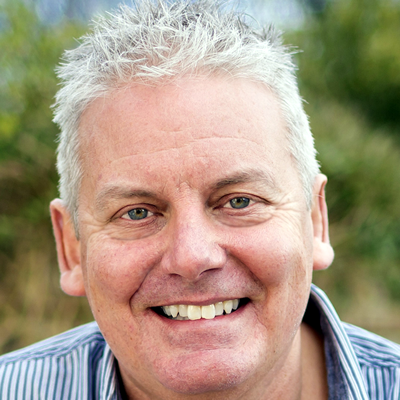 I’ve been running AdWords campaigns totalling millions of pounds since 2005. I didn’t think there was much I didn’t know about AdWords after all that experience, but I learned valuable new things straight away on this course. It’s really very good. 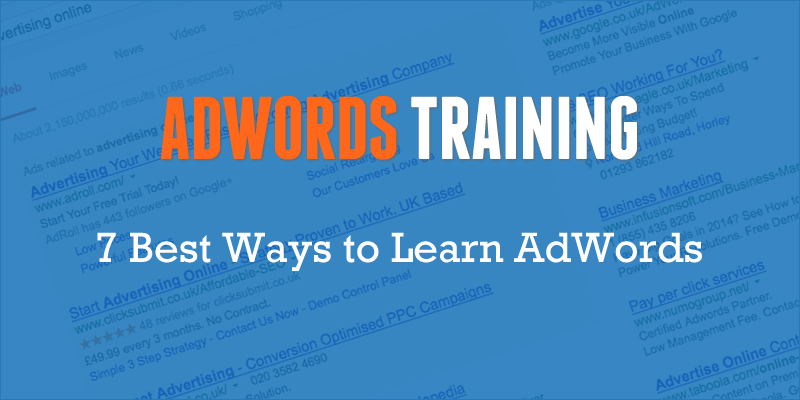 Over 6,000 people have taken this AdWords training course. It’s presented through 81 short video lectures, totalling around 16 hours viewing. It’s something of a steal at £35 for lifetime access. There’s also a 30 day money-back guarantee. Perry literally wrote the book on AdWords advertising. I bought this book myself back in 2010, and at the time I was already a Google-certified AdWords Consultant, but I still learned something from it. It’s been updated since then, as AdWords has changed quite a lot, and is now in it’s 4th edition. It’s very clear and easy to follow, but it also gives you pro tips and hard-won insider knowledge gained through Perry’s vast experience, that you don’t get from the standard Google training. Many people (myself included), prefer reading a book to on-screen training, so if this is your medium, get the book. Even if you choose one of the other AdWords training resources, I’d still recommend you get the book — you’ll pick up things here that you won’t get anywhere else. Lynda works differently from Udemy in that instead of paying for individual courses, you pay a monthly membership fee and you can take as many courses as you like. There is also a free trial period, which means if you’re quick, you could take this course for free. WordStream primarily offer software and managed services to help you get the most from your AdWords advertising. 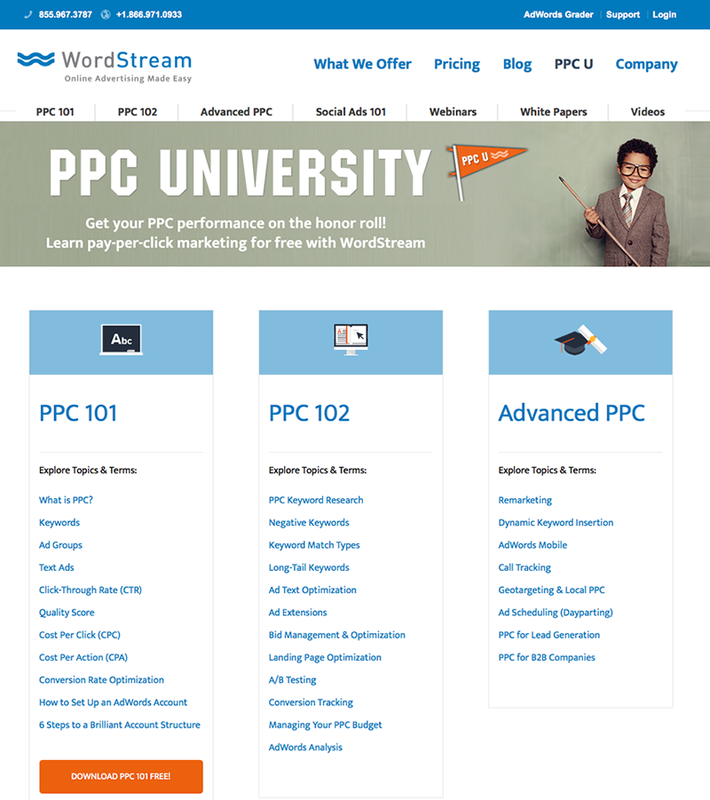 But they also have a very good (and free) AdWords training resource – PPC University. This is a series of self-select training modules that you can work through at your own pace, choosing what you want to learn. It’s a bit lighter and more engaging than Google’s own training. It also has some useful tips based on WordStreams experience in managing hundreds of AdWords campaigns. PPC Mastery is much more than just an online video training course, it’s a full membership site with a discussion forum, and daily emails guiding you through the course. The total course time is over 11 hours, far longer than the Lynda and Udemy courses, and it can be used to prepare for the Google AdWords Certification exam. There is also a free trial and a 30 day money-back guarantee. We all have our preferred ways of learning — what works best for us as individuals. Whilst the online courses, videos and books above may suit a lot of people, for others there is no substitute for a good old-fashioned classroom course. A classroom course has the advantage of a teacher you can interrupt and ask questions, and other students to interact with and spur you on. There are plenty of classroom AdWords courses available, but as you have to travel to them it’s difficult to make recommendations in your area. The best thing to do to find them is to Google “adwords training courses +your location”. In the UK, some of the leading AdWords training course providers are Diginius, Jellyfish and Emarketeers. In the USA, depending upon where you are you may find CardinalPath or LunaMetrics have what you are looking for. So there you have 7 different ways to learn AdWords — from AdWords training videos, online courses and tutorials, classroom courses, to a book. Some are free, some are paid-for, just pick what suits you and dive in. In 2017 it’s harder than ever to get traffic to your website and increase sales, but AdWords offers a unique opportunity to do just that (if you want to know more about AdWords read this Simple Guide to Google Adwords). 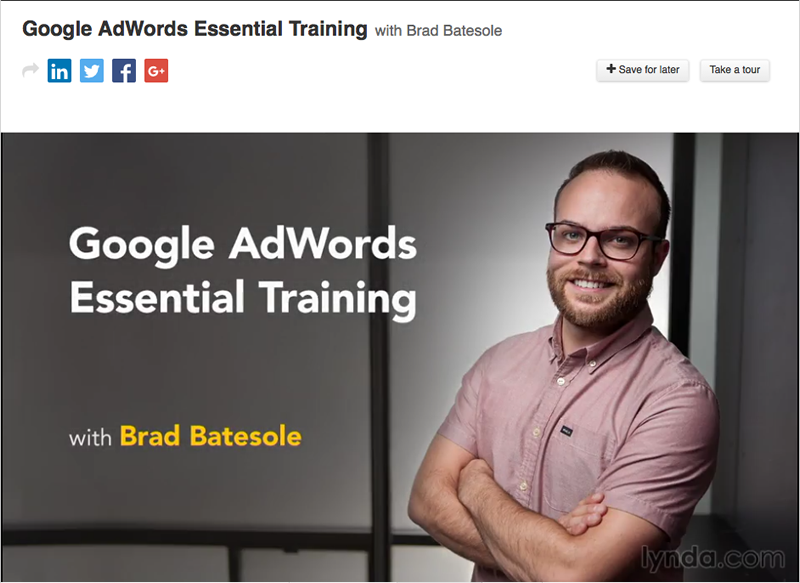 Do you have any recommendations yourself for AdWords training or courses? Please leave a comment below to let me know and I’ll take a look and maybe add it into this article. If you are running AdWords Campaigns, then it is vital that you create proper dedicated landing pages for each ad. You will also need to find the best keywords to use — take a look my favourite free keyword research tools here.